Growing up, we ate Uncle Ben’s Wild Rice all the time. Like, all the time. 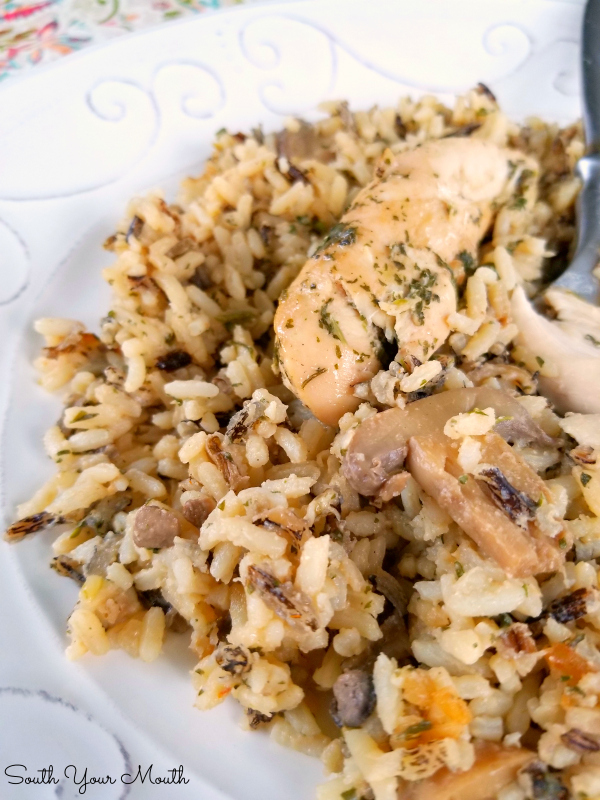 Maybe because Mama’s not a native Southerner so we often ate stuff like broiled fish or baked chicken (those are just two things that come to mind that aren’t dishes one would associate with typical Southern suppers) and the wild rice is a perfect side dish for stuff like that. Or maybe because of Daddy’s obsession with rice. It was a way to get him his rice without clogging his arteries with gravy. Whatever the reason, I was just always happy to see that orange box on the counter because, like my daddy, I love me some rice. Mama always prepared it with chicken broth instead of water and would often add a can of mushrooms to it. I still make it with chicken broth because it really kicks up the flavor. I keep a carton of chicken broth in the fridge and use it instead of water all the time. 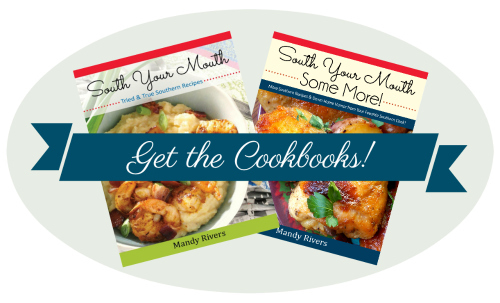 You’d be amazed what a difference it makes in everyday stuff you cook! 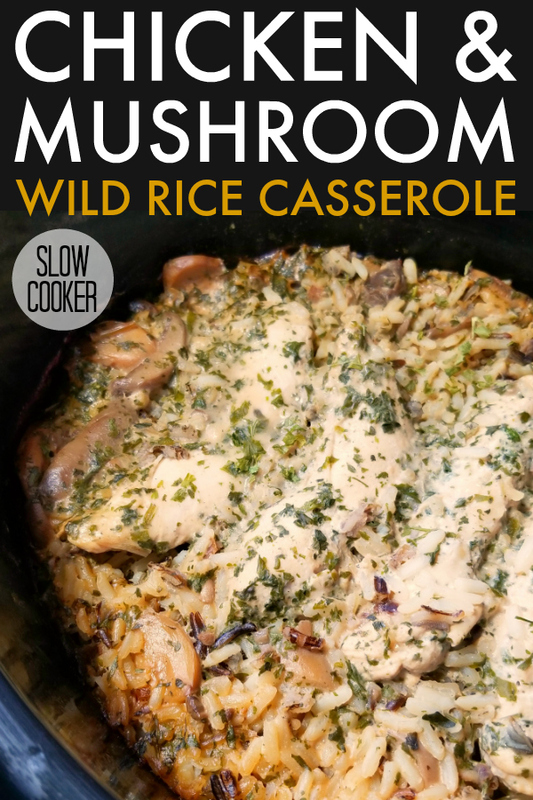 I was trying to think of a casserole recipe to make using wild rice and chicken but all the ones I glanced at online looked like you’d have to bake the dish for EVER (I reckon to get the wild rice done) and I didn’t want to have to do that so I thought I’d take my chances with the crock pot. And I’m so glad I did! I was shocked at how perfectly the rice cooked! It was fluffy and just like it is when I cook it on the stove! Plus the chicken was fork tender and everything came together so easily! AND I didn’t precook or brown anything. Too easy! I cooked this on High and think it’s probably best that you do the same. I’d worry that cooking this on low might yield gummy rice but if you try it and prove me wrong, I’d love it if you’d let us know! I think this would be awesome with chicken thighs too! If you try thighs, be sure to use boneless otherwise the chicken might not get done by the time the rice is done. I think you could totally use whole chicken breasts too. If you hate mushrooms, feel free to leave them out and use cream of chicken soup instead of cream of mushroom. Remove seasoning packet from both boxes of wild rice. Season chicken with contents of ONE seasoning packet. Add the remaining seasoning packet to a mixing bowl. Add chicken broth, cream of mushroom soup, garlic powder and butter to the mixing bowl with the second seasoning packet then whisk until thoroughly incorporated. Add mushrooms and both boxes of rice then stir well. Spray a medium-sized crock pot with cooking spray then pour rice mixture into crock pot. 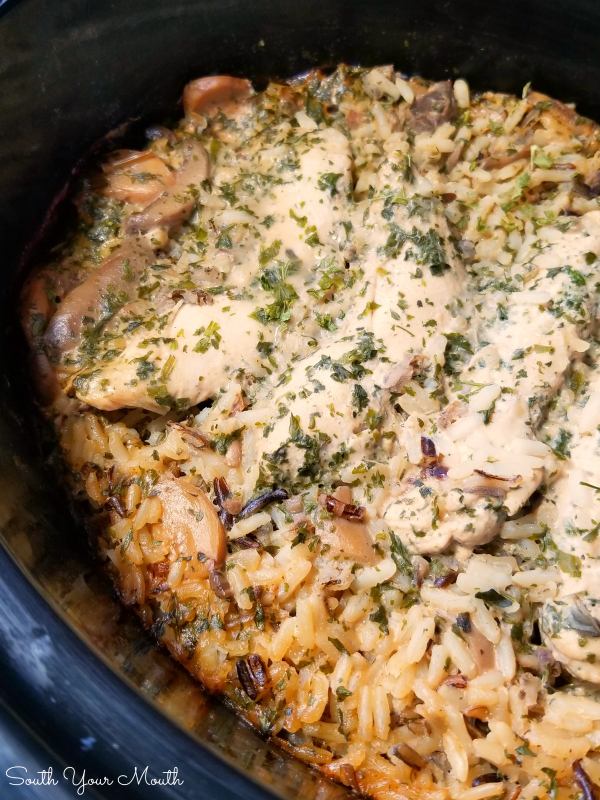 Place chicken tenderloins in a single layer into crock pot (they will sink – that’s OK because they will rise back to the top when the rice cooks). Cook on high for 2.5 - 3.5 hours or until rice is tender. 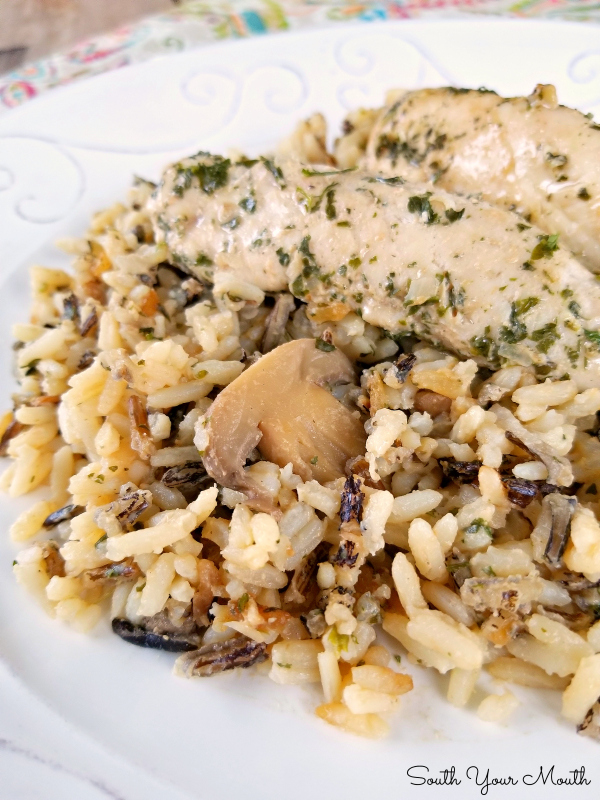 Use Uncle Ben's Long Grain & Wild Rice original recipe, not fast cook. My rice is done after 2.5 hours but the crock pot I use for this cooks very hot. Just reach a fork into the center of the dish to fish out some rice to test for doneness after 2.5 hours then cook longer if needed. I’ve never cooked this on low heat. I worry the rice might become mushy if cooked so slowly. If you try it, please comment below to let me know how it works! Feel free to leave out the mushrooms or use another variety of creamed soup if desired. I think diced water chestnuts would be great in this for a little crunch! Looks so good how long would you cook this in the instant pot. Thanks, Nanci! I don't have an instant pot (yet!) so I don't know how to tell you how to convert the recipe. Look wonderful...what if you dont have crock pot ..what would you recommend for cooktime for a standard oven ? I don't think I'd try this in the oven. I would prepare in a skillet on the stove with a fitted lid. Cook per package instructions for rice arranging the chicken on top. This was easy and delicious for those busy nights when you don't have time to cook. I used fresh sliced baby bella mushrooms in place of the canned mushrooms. I think I'll try it in my Instant Pot next time to see how it comes out. 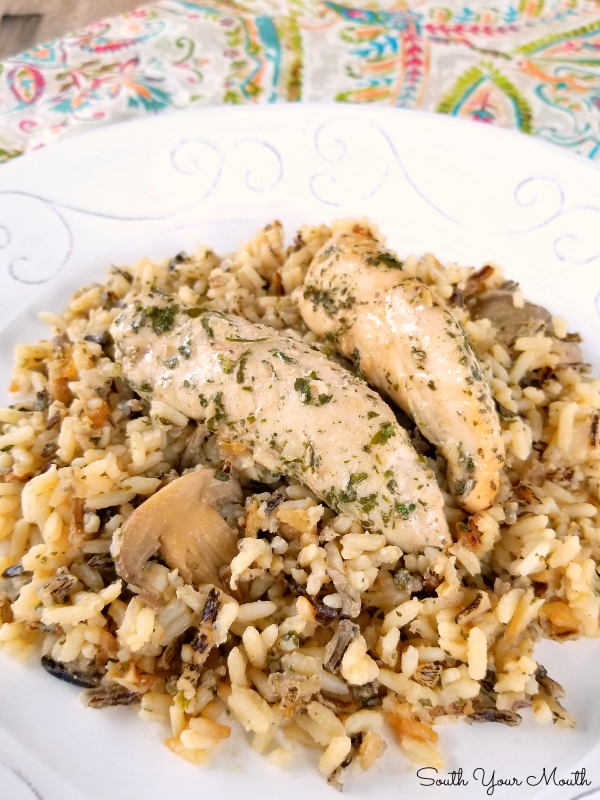 We loved this recipe and my husband said it's a home run! How do you think the recipe would be using just 1 box of rice? I made this last night and was a real disappointment. Even with 2 packets of seasoning, it was very bland and the rice was just too mushy. Not a keeper for me.